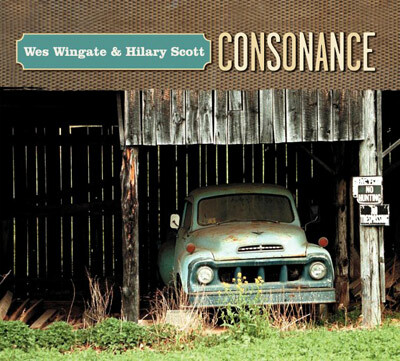 Wes Wingate and Hilary Scott began working together in 2006 when Hilary Scott was one of the artists featured on the compilation Million Dollar Bash, (Missouri-based artists tribute to the songs of Bob Dylan). Wes Wingate had long admired the work of Bob Dylan and had the vision to bring many musicians together for this extensive project. Hilary’s contribution to the compilation was a version of ‘To Make You Feel My Love’, and after working together in the studio, Wes and Hilary decided to perform a duet together at the live concert releasing the CD. They performed Dylan’s ‘Oh, Sister’ and it sparked the idea to record an album of duets together. Both songwriters, singers, and musicians in their own right, Hilary and Wes have also been featured separately on multiple albums, have produced and co-produced many projects, and perform as soloists and members of different bands, touring regionally and internationally. Both count among their inspirations some of the great male-female vocal pairings such as Dylan and Baez, or more recently, Robert Plant and Alison Krauss. With the concept of putting vocal harmony and lyrical significance at the forefront of their performance, Wingate and Scott moved forward by choosing a mix of original and cover songs. ‘Consonance’, the resulting album, is set for release in May of 2009. Songs include covers of Dylan, Ryan Adams, Colin Hay and others, and original songs written by Scott and Wingate.